Easy Prep Phonics Games to Provide Practice With Short Vowel ă Spelled Words! Roll It! 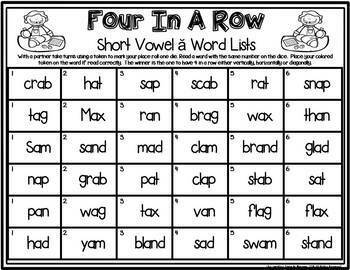 Read It Short Vowel ă Word Lists Games: This game can be played with one, two or a group of children. 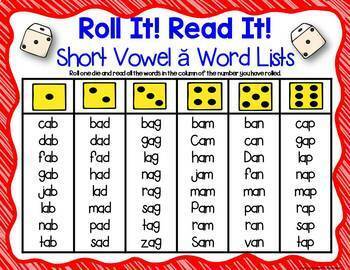 Children need to roll one die and read all the words in the column of the number you have rolled. Children try to increase their word fluency as they practice each list. Black Line Masters: The black line masters can be copied for each student to practice and/or can be sent home for practice. 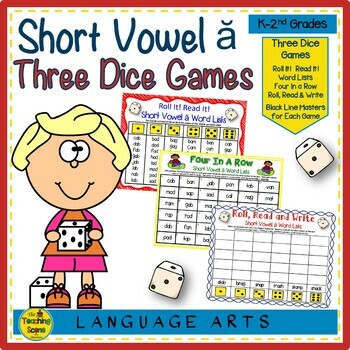 Four In a Row Short Vowel ă Word Game Boards: With a partner take turns using a token to mark your place roll one die. Read a word with the same number on the dice. Place your colored token on the word if read correctly. The winner is the one to have 4 in a row either vertically, horizontally or diagonally. Students can try to block their opponents spaces. Note: Children can also use two different colored Vis-A-Vis Markers that can be wiped off to mark their turn on the game boards or use two different colored tokens. Black Line Masters: The black line masters can be copied for each student to practice and/or can be sent home for practice. 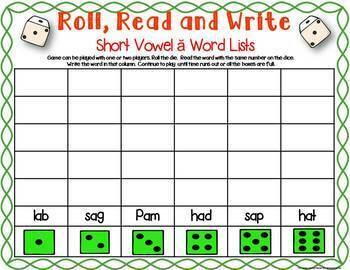 Four Roll, Read and Write Short Vowel ă Word Game Boards: Game can be played with one or two players. Roll the die. Read the word with the same number on the dice. Write the word in that column. Continue to play until time runs out or all the boxes are full. Note:Children can also use two different colored Vis-A-Vis Markers that can be wiped off to mark their turn on the game boards or use two different colored tokens. Black Line Masters: The black line masters can be copied for each student to practice and/or can be sent home for practice. Kids have some reading fun while learning their short vowel ă Words! ▶️ Phonics Set 2: Roll It Read It!